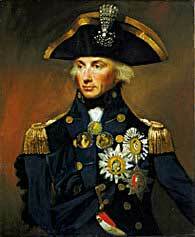 Born in Burnham Thorpe, Norfolk, the sixth of eleven children, Nelson joined the Navy at the age of 12. He became a captain aged 20, and saw service in the West Indies, the Baltic and Canada. He married Frances Nisbet in 1787 in Nevis, and returned to England with his bride to spend the next five years on half-pay, frustrated at not being at sea. When Britain entered the French Revolutionary Wars in 1793, Nelson was given command of the Agamemnon. He served in the Mediterranean - helping to capture Corsica and engaging in battle at Calvi, where he lost the sight in his right eye. He would later lose his right arm at the Battle of Santa Cruz de Tenerife (1797).Nelson was a complex leader who balanced a personal longing for honour and glory with a compassion and respect for his men. As a commander he was known for bold action, and for the occasional disregard of orders from his seniors. This defiance brought him victories against the Spanish off Cape Vincent in 1797, and at the Battle of Copenhagen four years later. Here he ignored orders to cease action - by putting his telescope to his blind eye, and claiming he couldn't see the signal. At the Battle of the Nile (1798), Nelson successfully destroyed Napoleon's fleet and bid for an overland trade route to India. His next posting took him to Naples, where he fell in love with Emma, Lady Hamilton. Although they remained married to others, they considered each other soul mates and together had a child, Horatia, in 1801. Earlier in the same year Nelson had been promoted to the rank of Vice-Admiral. With the words 'England expects that every man will do his duty' Nelson successfully inspired his squadron before his most famous engagement, at Cape Trafalgar. The battle saved Britain from threat of invasion by Napoleon, but it would be the British commander's last. Struck by a French sniper's bullet he died on the first day of battle, 21 October 1805. Nelson never wore an eye patch. He added an eye shade to his Admiral's hat, like a peak. He didn't say 'I see no ships'. Instead he said, during the Battle of Copenhagen, '...I have only one eye. I have a right to be blind sometimes', and, raising his telescope to his blind eye, 'I really do not see the signal'. 21 October 2005 is the 200th anniversary of the Battle of Trafalgar.